How To Pass Java SE 7 Programmer Certifications? You are here: Home / Ebooks / How To Pass Java SE 7 Programmer Certifications? I already passed OCA and OCP for Java SE 7 Programmer Certifications after long time preparation. In this article I am sharing my experiences about doing the certification and the tips I can give you to get good score. Although my score was not higher, I am sure the following information will help you. We all know that Java Professionals are more hot in IT industries and certified professionals are even more on demand. Java programmer level certifications are intended for the programmers to prove that they really know the Java programming language for latest Java Language Fundamentals and APIs. Being Java Certified can help you to get more remuneration and recognition. The latest programmer level certification is for Java SE 7 version and it is divided into two levels, 1. OCA and 2. OCP. Who are all can take this certification? The OCA for Java SE 7 (OCAJP) is for entry level Java programmer to know the basic language fundamentals and OO design (class, methods, constructors, interfaces, abstraction…etc). So anybody interested to move into Java career / peoples already have enough experience in Java technologies can take this certification. Note that this certification does not require any pre-requirement. The OCP for Java SE 7 (OCPJP) is an advanced level Java Programmer exam which can be taken after clearing OCPJP. 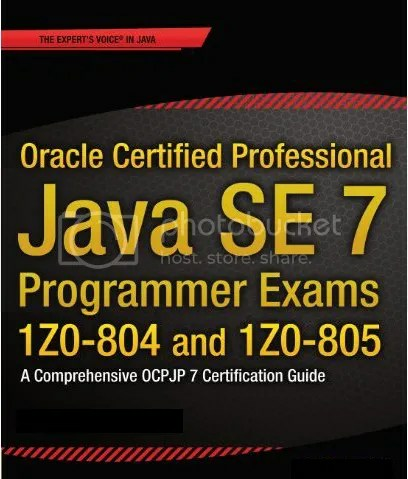 My actual plan to complete Java Programmer certification was for Java SE 6 since it has only one exam instead of two levels in SE 7, but my colleague suggest me to take latest exams. My colleague said that the first part (OCA exam) was much easier than second part (OCP) when he took the exam. It is hard to cope up with latest technology changes when you prepare for a new certification which does not have proper study books. My colleague gifted epractize labs exam simulators for my preparation. I already have Kathy Sierra book which was purchased last year. He also gave me some study notes that he collected from Oracle’s free tutorials for Java 7. Finally I had some kind of material in my hand. – Started my preparation with OCA Training Lab. The product really simplified my exam preparation, it has study guide and so many practice questions with brief explanations. I decided to take exam after getting more confidence with mock exams. The SCJP book by Kathy Sierra is good for understanding fundamentals along with OCA Training Lab study notes. Completed my OCAJP with 84% score. Thanks to my colleague Dieter for providing enough guidance. Following week I started preparing for OCPJP exam. Oh.. god, this exam is totally different from OCA. This exam requires lot of Java SE 7 changes like NIO2, Exception handling changes (try with resources, multi catch), design patterns, and much more. The preparation for OCP tooks around 67 days and still I feel that my knowledge is not enough to take real exam. I took another 2 weeks to brush up my knowledge and appeared this exam. Completed my OCPJP with 71%. I am not bothered about my score. I just wanted to pass the exam. But I prepared very well and some wrong answers happened only because some questions were not clear in my opinion. E.g. the questions about Path, diamond operator and patterns were not clear – sometimes several answers looked correct to me. Which resources you use to prepare for these Java exams? The book “SCJP Sun Certified Programmer for Java 6 Study Guide” (Author: Kathy Sierra): This book will be useful for OCA exam and not for OCP Java 7. OCA Java SE 7 Training Lab for OCAJP 7: Excellent mock exams, I think you need to have this simulator to prepare based on latest OCA syllabus. These mock questions are tougher than real exam. If you can reach 60 percent goal in each topic here, you will probably pass the real exam. OCP Java SE 7 Training Lab for OCPJP 7: You must have this product to clear OCPJP 7 exam. During my preparation, no book or simulator was available for this exam except this software kit. If you can reach 70-80 percent mock exam score here, you will probably pass the real exam. The real exam is slightly tougher than these mock exams. I propose every Java programmer to do the exam, but if you have time to prepare only after work or at the weekend, plan at least six months for completing this two exams. If you have any comments about my experiences, please buzz me. Schumacher has more than four years experience in java programming. He has worked as a technical writer and software developer in various domains using Java EE technologies. could you please OCA Java SE 7 Training Lab for OCAJP 7 material . I am preparing for OCA SE7.